Anybody here play this yet? Basically, it's a 8 player, 1v7 multiplayer game, where there are 7 counselors facing 1 randomly chosen Jason. 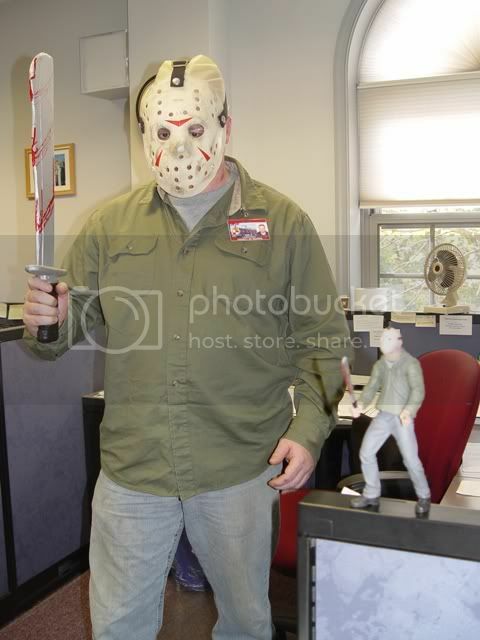 Your goal as a counselor is to escape the camp (there are methods to repair a car or motorboat and leave, or call the cops) while avoiding getting murdered, and your goal as Jason is (of course) to kill all the campers. And the games have a time clock, so even if you go the distance with Jason, games only last about 20 minutes or so, so it's almost always action and doesn't drag. They had some major server issues at launch (I didn't have major problems on PS4, but I hear it was a nightmare for XBox people), but those seem to have been improved a ton in the last week. There's still a couple of glitches that some players are exploiting to "cheat", but it looks like those will be addressed in the next patch. I actually contributed to the Kickstarter, so obviously I was looking forward to it, and so far it's not only lived up to expectations, but surpassed them. Definitely recommend it. So no single player where you can pick Jason and go hunting? What happens when 20 minutes expires and Jason and some victims are still alive? Definitely looks pretty cool though. I have it on XB1 and it's VERY fun to play, but you are right AJLe with it being pretty glitchy there. They've beefed up their servers and today they're releasing free content because of those issues. Single player isn't available yet but is supposed to be added later this summer. Surviving the full 20 minutes means you live and counts the same as making an escape via calling the cops, by car or boat. The hardest thing to do is to kill Jason though...it's a long process. Yeah, you can last the night and survive to win. However, you level up with the more XP you accumulate, and if you fix the car or boat, or call the cops, you get bonus points along with the points you get for surviving, so there's an advantage to winning those ways. I don't know how people pull off killing Jason in a truly competitive game - I imagine a large percentage of Jason kills have been in private or team games where the Jason was cooperating, just so people can say they've done it. I mean, you have to have a female character wearing the mother's sweater, AND have somebody playing Tommy Jarvis, AND have him carrying a machete just for it to be even possible, so it really is an accomplishment if you're able to pull all that off in a truly competitive gameplay situation. I'm also getting a kick out of discovering (either by playing as Jason or being a victim) all of the special environmental kills in the game, depending on where you are on the map. Off the top of my head, I've seen the faceplant into the fireplace, the toilet drowning, impalement onto a birdbath, chokeslam onto a broken tree stump, and the head slammed into the doorway. It's always fun to stumble upon a "Well, I haven't seen that one yet..." kill. My PC is from 2008. When I upgrade gotta check this game out. Too bad you don't have a PS4 - we could set up a game online, you could start as a counselor, I'd be Jason, and I could, uh...show you the ropes. It's not an AVGN episode, this is a Play Through.